This is the second in a series of newsletters that should help explain my tree planting information in more detail than ever before. A percolation test, or perk test, is a way to evaluate the absorption rate and/or drainage of the soil. When time allows after digging the hole and before the tree is planted, fill the hole with water and wait until the next day. If the water level does not substantially drain away overnight, a drainage problem that would negatively affect most trees is indicated. For wet soil-adapted trees like bald cypress and willows, this procedure isn’t necessary. At this point, the tree needs to be moved to another location or have drainage added in the form of a PVC drain line set in gravel running from the bottom of the hole to a lower point on the site. 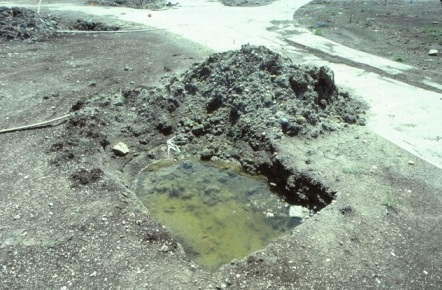 Another draining method that sometimes works is a pier hole dug down from the bottom of the hole into a different soil type and filled with lava gravel. A sump from the top of the ball down to the bottom of the ball does little if any good. In my opinion, this is a waste of money and might have a negative impact on the tree. Positive drainage is critical, so do not shortcut this step. For soils where the water doesn’t drain away well, spraying the sides of the holes with 3% - 5% hydrogen peroxide will help initial root establishment. Hydrogen peroxide is especially good for tree holes dug in hard clay soils. It loosens the wall of the hole and creates a more receptive surface for the tree roots to enter.